The late 1980s saw an alarming decline in U.S.-Libyan relations. A plane hijacking and airport attacks in Rome and Vienna in 1985, all linked to Libyan leader Muammar Qaddafi further escalated tensions between the two countries. The U.S. discovered that surface-to-air missiles were being deployed in Libya around the same time. In contravention of international sea regulations, Qaddafi also claimed the whole Gulf of Sidra for Libya, drawing the so-called “Line of Death” on the Mediterranean. 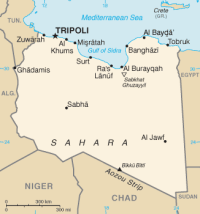 This led to the United States bombing of Libya on April 15, 1986. Michael Ussery, Deputy Assistant Secretary (DAS) for Near East Asian Affairs from 1985 to 1988, recounts the run-up to the attack, the plans to topple Qaddafi, how the Libya desk officer refused to participate in the planning on moral grounds, and the blowback encountered over plans to spread disinformation through the American media. 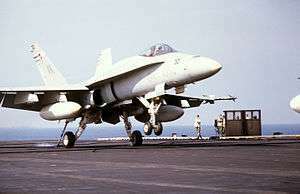 The U.S. maintained its rights to conduct naval operations according to international rules beyond the line and after the 1985 terrorist attacks, the U.S. began its “Freedom of Navigation” operations. The last of three operations turned into a military confrontation. In retaliation, Qaddafi covertly ordered numerous terrorist operations, one of which was the Berlin disco bombing in April 1986, where two Americans were killed. I spent two years, I probably spent close to 90 percent of my time, on Libya, 10 percent on the rest of the Maghreb. But the job included Congressional and press affairs for the entire region. At the time you had the Afghan War; you had things hot in Lebanon; you had the Iran-Iraq War, the Mideast Peace Process — it was fantastic to be involved in those issues every day. I loved it. Qaddafi was always seen as a little bit crazy and very much dangerous, very destabilizing, very threatening to Tunisia, to Egypt, to the Sudan, trying to build an elaborate terrorism network. Certainly, during that two-year period, the biggest criticisms we took, which I was comfortable with defending, were that we shouldn’t have bombed him — and I certainly feel it was the right thing, the military attack in mid-April 1986 — and the other was that we were elevating him and making him more important than he was and deserved to be. Maybe, but sometimes my view is that if some guy’s trying to hold a gun to you and trying to rob you on the street, it’s tough to say, “Well, let’s don’t give this guy too much attention.” But to me it was, we were reacting to him, and out of necessity. But the first big decision came in early January. The President made a nation-wide speech, and he made the tough decision not to respond militarily against Libya but to put in far-reaching economic sanctions, prohibitions against travel and business with Libya, and to try to block American subsidiaries in Europe from doing business in Libya, and to try to get the Europeans on board. So it was really quite a major undertaking. And my job initially was to chair the emergency task force which tried economically and politically to isolate Libya to the extent possible. What happened was for three months we kept tightening the noose on Qaddafi and were pleased. 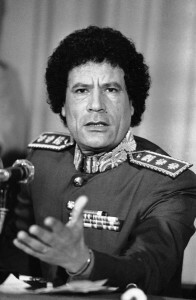 Qaddafi responded by plotting four other terrorist activities, including the possible kidnapping of our ambassador in Rwanda, which we intercepted information on that and thwarted that before it ever [took place]….But he did succeed in having a bomb planted in a Berlin disco, which killed a U.S. serviceman and a Turkish woman…. The “Line of Death,” which Qaddafi declared. Instead of the internationally accepted 13-mile limit on international waters, he drew a line which went across from the west to east of the Gulf of Sidra, and said, “Once you come in here, 13 miles doesn’t apply — you’re in Libyan waters.” And very few would ever test it. Of course, there had been an incident in 1981 where some American pilots crossed the line and shot down two Libyan airplanes that went out to intercept them. So Cap Weinberger finally agreed to take some ships across the Gulf. And the interesting thing I saw was that when we acted — and maybe this, people say, is a lesson from Vietnam, and maybe it’s the right lesson, but it was interesting to find out that for whatsoever we wanted to do, the Defense Department took the view, whatever we do, we do it with major overkill. We don’t take one ship across; we’ve got a couple of aircraft carriers out there; we’ll have other ships — we go big time. And so if something happens, we have plenty of assets in place. We were pretty sure of the source being the Abu Nidal organization, and the issue became, was Abu Nidal acting on behest of Qaddafi with Libyan support, or more on behalf and with the support of the Syrians? And there were certainly journalists and critics in the United States who said we’re going after the wrong guy, we ought to be going after the Syrians on this one. And the Syrians were hot behind the killing of 240 Marines years before in Lebanon, and we hadn’t done anything. When the Syrians did something, we didn’t do anything; when poor little Libya gets behind something or may be behind something or gets a fingerprint on something, we try to turn it into a Libyan operation. I think what we felt sure about was that the Libyans had helped the Abu Nidal operation in the Rome and Vienna airport attacks. It was much clearer than a Syrian hand. But we never could say with 100 percent certainly that Qaddafi himself ordered or sanctioned the airport attacks. We could see Libyan operatives helping Abu Nidal, but they did that on an ongoing regular basis. The airport ones where we weren’t sure if Qaddafi himself personally ordered them or just had his intelligence network giving its ongoing support to the Abu Nidal terrorists. For the Berlin disco we intercepted messages from the Libyan government to go ahead and bomb the facility. The American public was surprised. There was a good cloak of secrecy around the decision to bomb Qaddafi News broadcasts interrupted their early evening shows to announce that we were now in the process of bombing Tripoli. The media hadn’t expected it. They had believed a possible attack could be decided in the next week or so, but might not be decided by the President. So it was a total success in terms of the element of surprise. The President worked with a close group inside the White House. I was told on the eve of the bombing to write a paper speculating what would happen if Qaddafi died, what would happen inside Libya. And by myself I wrote this paper, and I basically supported the idea that even if Qaddafi lieutenants succeeded him, the Libyans’ hostile foreign policy would change. You might have the same kind of political domestic politics, but you really would dramatically change the external politics and the possibility of moderation. So that told me we were getting pretty serious about that, and only on the afternoon of the bombing was I told, be sure to stay late tonight, we’re going to need to work late, which further alerted me that an attack was imminent. But that’s how secret it was. Q: Were there problems with the American public? Well, there was some problem after the Gulf of Sidra, but mostly broad support. This is just a provocation, and of all times, now that you’re in with Qaddafi why do you have to send ships now to do what we profess was just a routing testing? And the view was, look, if you don’t challenge the right to cross that line, then over time, you allow his claim to stand. And of course, they were like, “This is a provocation, now’s the worst time, you could have waited a year to test this,” blah-blah-blah. Of course, there was truth to that. But when we bombed Tripoli and Benghazi on April 15, there was great American public support for the military attack on Libya and surprisingly good public support in Europe, maybe more than I had imagined, though the governments there were more critical — except our allies the Brits. You know, the governments felt we were being the reckless Rambo Americans, and Ronald Reagan was being a Rambo cowboy maverick leader again. But the people in Europe were very supportive, and that quickly tempered the support of the governments in Europe, and they saw that we were having success, and it had certainly thrown Qaddafi and his régime into turmoil, something of a tizzy, and so the reaction came around. 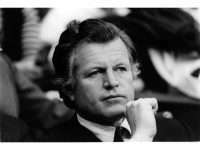 Support in Congress was very strong, and I remember I was called and told, “Look, Senator Kennedy needs somebody to go up and brief him right now on why we’ve attacked Libya.” And I went, “Oh, God, well, Ted Kennedy, liberal Democrat, he doesn’t like that we’d gone out there and done this macho foreign policy, and I’ve got to go up there and take the heat.” So I went up there. I saw a group of other senators who were very supportive, applauded President Reagan for attacking Libya. I said, “Well, he’s about to launch more terrorist attacks. Here’s what was going on.” And I said, “And we even found out he had a terrorist plan to kidnap our ambassador in Rwanda.” And Kennedy paused, looked at me, looked around the room (and there was only Kennedy and I in the room), and he said in his famous Boston Kennedy accent with a little bit of stuttering, “W-well, where’s Rwanda now?” And I could tell, of course, he had no idea where the hell Rwanda was. And of course, there I was, new to the Arab World, and my instincts told me that this doesn’t make sense. Nobody likes this guy. And there was a case where, you know, I said, Listen to your gut. I mean, not that it was my decision, but I was in there having to advocate and lobby what our course of action should be and actually I was for more military action from the get-go, from January, than most people and was definitely supporting military action. And my gut said, This is not true; it doesn’t make sense. Why would all these people come out? Why would these governments hurt their relationship with the U.S. for what we do in response to being attacked by Qaddafi? And after our military strikes in April, these people, some of them, were calling me and saying, “Well, you know, I tell you what, I’m really surprised. I never would have believed that it would have looked like this or that you would have had this reaction.” And so that was gratifying. When the bombing started I received a huge packet of questions and answers for the media that the White House was going to use to prepare the spokesmen and all that. One of the questions was, in the event that Qaddafi died during the raid …and so the answer was to be, “Well, he wasn’t a planned target; it just was a fortuitous event.” That was press guidance written by Oliver North. And of course, that was a real botch, because the fact of the press guidance itself became public information, and became part of the proof that, of course, we really were targeting Qaddafi. But Qaddafi really was in trouble. He went out of sight, and for about four months he made no public appearance in Libya. He was on the run; he was considered to be off-balance, just psychologically in a funk over the raid. And we managed to commit a great gaffe, a great overreach. I learned something about overreach in foreign policy through this experience because, really, everything on the surface said, one good push and this guy’s out of there; he can be toppled. And we knew we didn’t have the resources to do it. We weren’t prepared to go bombing again, that we needed — that we analyzed, and that was part of the analysis, that the real way to topple this guy was from a coup internally of those around him, that it wasn’t going to be outside dissidents or others who came in and took over. Well, we’d be delighted, and felt like even if internally Libya maintained very similar policies through a Qaddafi successor around him, that the external dimension of foreign policy of this little country, causing ferment around the world and sponsoring terrorism, could end abruptly. So in true Reagan fashion, we managed to do things out of the normal circles and channels, and instead of tasking the CIA to write a plan to do this, a tightly held group led by the NSC tasked me and my staff to give them their best ideas, to write a draft plan that they would then in turn vet what they liked with the CIA. I turned to my Libya Desk officer, Roger Dankert, and told him, “Here’s the objective. Of course we’re not going to support an effort to assassinate Qaddafi ” blah-blah-blah, “But we are going to do whatever we can covertly.” Well, it was really a stupid tasking for the State Department to be in the business of doing a covert plan, but we were getting pretty good at that in Nicaragua, Afghanistan — more and more the State Department was being drawn into the covert side of foreign policy. So I wrote the plan — about a six-, eight-page plan — to cause trouble, keep Qaddafi further off balance, have his entourage and guards around him worried about future intervention by the US Government and others, trying to bring everything to a head, which hopefully would lead to a coup d’état. In it, I wrote a section about putting disinformation into Libya about U.S. intentions and using even possibly leaking things erroneous through certain foreign media channels. I wrote the plan, and I had moral compunction against trying to topple Qaddafi at almost any price, and so I sent it to Howard Teicher and Dennis Ross at the National Security Council. Now Dennis, of course, as we know, more than 12 years later is still very central in the Mideast Peace Process and really one of the architects of the Mideast Peace Process. They loved it. Howard decided that he would rewrite it, just edit it really; but one of the edits was Howard didn’t think and didn’t understand the idea of the disinformation messages that we’d bombard into Libya. He added a phrase in there that was disinformation “including through the American media,” including like planting stories in The Wall Street Journal or something like that. And Arnie Raphel, who was the Principal Deputy Assistant Secretary in the Near East Bureau and later Ambassador to Pakistan, who was killed in the airplane explosion and crash when he was with President Zia in Pakistan, Arnie also had gone over my plan before we sent it to NSC, agreed with it; but Arnie and I never saw the revised version that Howard Teicher did. Well, somebody in there, of course, appalled by this idea of disinformation in the American media, leaked the plan, and it became an overnight front-page controversy: that the U.S. government was planning — though it never had approved the plan and that was never the original intention of the plan — it was easily cast that the U.S. government, the Reagan Administration, was planning to lie to the American media and use them as a foreign policy tool to try to overthrow Qaddafi. He realized that we were playing a bluff game to a large extent and that he could come out. He wasn’t about to get zapped by F-16’s or 15’s or anything, F-6 fighters. And in effect, at that moment, the real momentum of the campaign against Qaddafi came to a screeching halt, in August of ’86.